These themes are free of charge, so there’s no cost associated to them. The only cost is for web hosting, to have a specific domain name and brand your website accordingly. However, free themes provide no support. A good option is to select a freemium theme (free theme with an improved, premium version). In case you want more features, and support for the theme, you can upgrade to premium any time. Free WordPress themes are officially approved. They are all verified by a team, and they meet WordPress quality requirements. Given that these themes are free, you should look for one that has as many options as possible. To make the most out of a free theme version and customize your website accordingly, you should search for an extended range of customizations. However, please note that free themes tend to provide a minimalist design, as compared to premium ones. This is good as a minimalist design will result in speedier WordPress websites. Free themes are simple and easy to use, as specially designed for beginners. So, if you are creating your first website or just need the basic elements to build one, free themes are for you. Search for one that best suits the purpose of your website and start customizing it. There’s no need to code, hence such a theme is very useful for non-technical persons, and non-programmers. Another important aspect is to choose a theme that’s easily adaptable to your niche. Hence, you should look for a multi-purpose theme. Nowadays, mobile responsiveness is more than an additional feature. It’s most of a requirement for any theme, so please don’t forget to check if the theme is mobile responsive, so the website displays appropriately on mobile devices. As important as mobile responsiveness, the speed of a website loading is crucial to that website performance. You have to look for a theme that has clean code behind it, so it doesn’t hinder website loading time. The basic condition of a website to be noticed, is to exist. The second one, to be visible in search engines results pages. So, SEO-friendliness is another major characteristic you should search for, when choosing your free theme. That theme should be compatible with most popular SEO plugins, such as Yoast SEO or All in One SEO Pack. You should consider the theme compatibility with other popular plugins, such as those dedicated to integration of a contact form into the website (e.g. Contact Form 7), or of a newsletter (e.g. MailChimp). A free theme is also a good option for web designers who are inclined to experimenting with different designs. This might be restrictive, if they chose premium themes with costs attached to them. Hence, free themes provide more options to try different layouts and designs. All in all, the website you build with a free theme should look distinct but feel familiar. It needs to stand out and be unique, while it keeps navigation intuitive. Look for the most appropriate theme that meets this requirement. 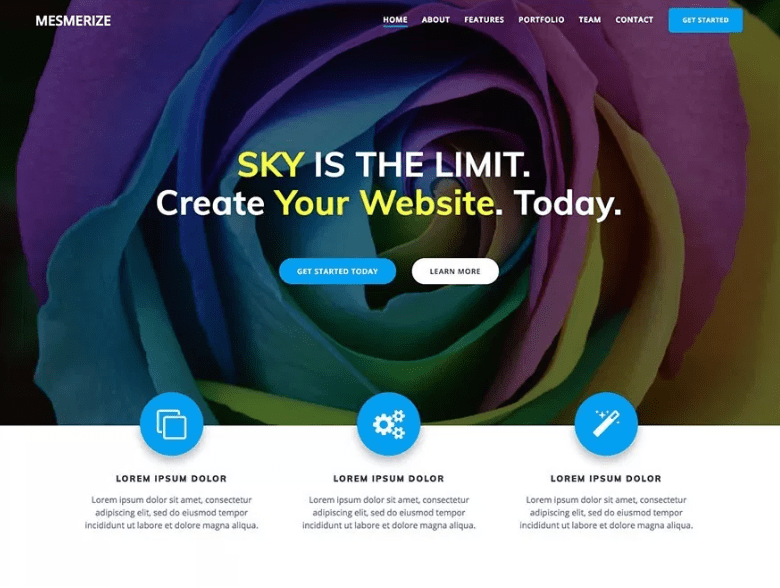 Mesmerize is a free multi-purpose theme designed to build a website in no time. It is one of the best choices regarding the variety of customization options (video background, slideshow background, gradient overlays, etc.). It has many content blocks you can add into a page and combine to have the perfect presentation. It has plenty of customization options for the Header (which is of key importance in catching users’ attention). It provides options for differentiating among front-page navigation, inner pages navigation and mobile navigation. It can also be customized for online stores, due to its compatibility with WooCommerce. Mesmerize is mobile responsive, so it displays correctly on mobile and tablet. 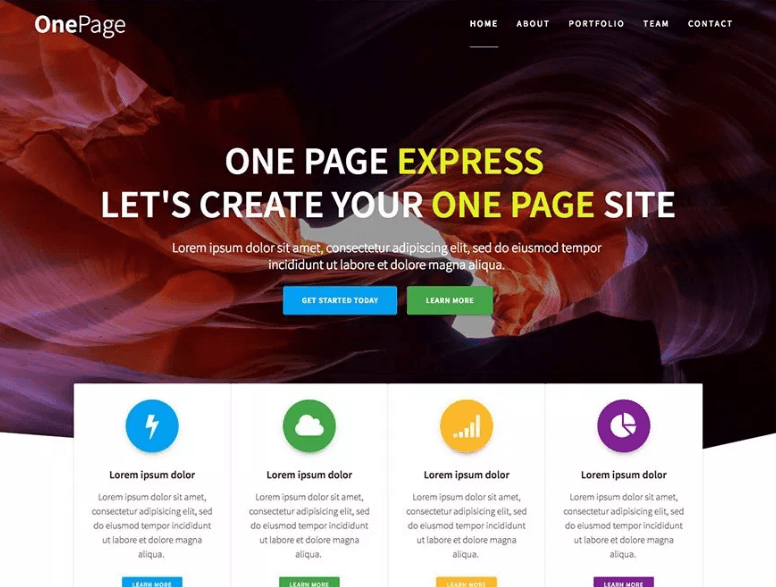 One Page Express is a free theme specially designed for one-page websites. It has a wide variety of features you can use to create a stunning website in a few hours. It has many pre-defined page sections, some of which are overlappable and give a more stylish look to the page. It has options for customizing the Front-Page Header with specific designs you can select from, depending on the brand personality. Ready-made content blocks can be added into the page by simple drag-and-drop. One Page Express has all the needed features to make a one-page website impress its visitors right off the bat. 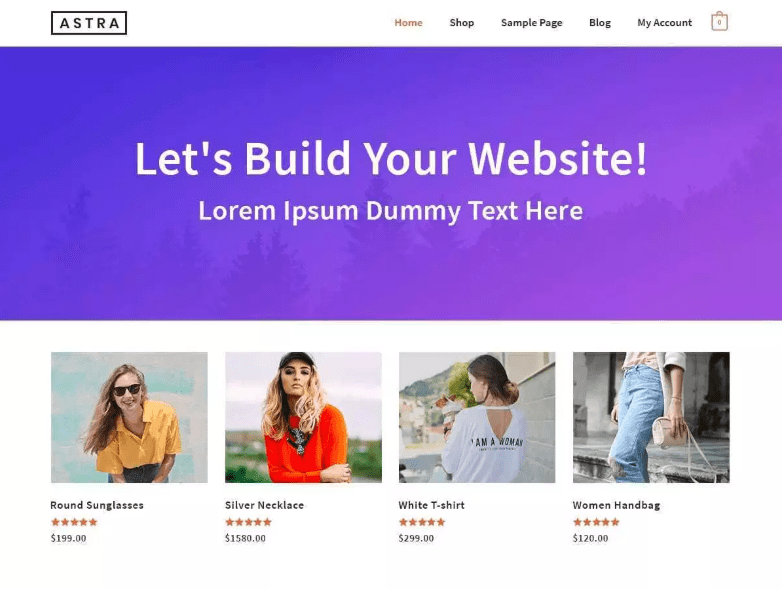 Astra is a good choice as a theme for any niche, e-commerce included. That’s why it comprises features destined both to creating a strong brand online, and to maximize conversions. For the backbones of the website, you can choose the most appropriate layout. You have different options for the Header, breadcrumbs, sidebar, blog, footer, etc. Combine them so content perfectly fits into the website architecture. For branding, features regarding colors and background of pages, as well as typography, are of great help. We’ve already mentioned conversions: Astra has options to customize buttons site-wide (both buttons generally used in the theme, and buttons used in Header). 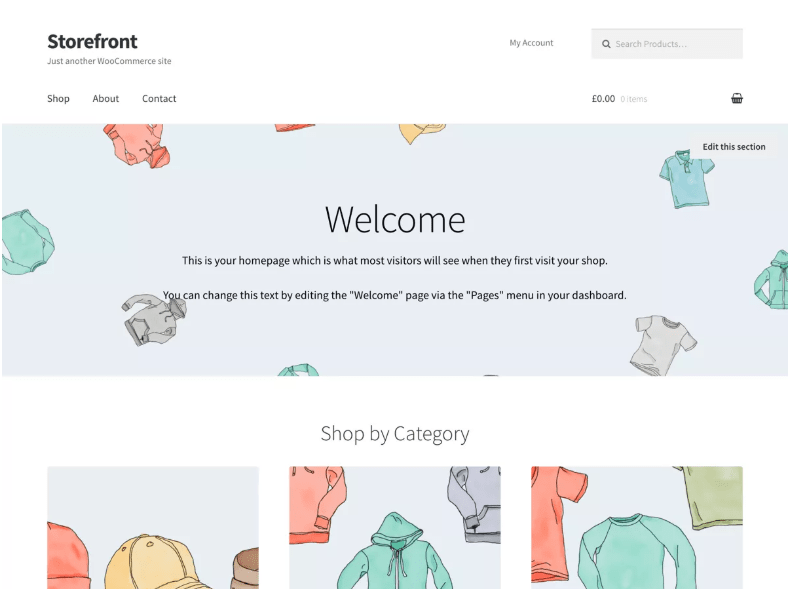 Storefront, as the name itself says it, is a free theme for e-commerce. It’s ideal for building online stores and customize them accordingly. You have 2 options for the website general layout. As it is an e-commerce theme, you have the possibility to customize buttons for the entire shop. You can make them prominent with the help of colors for the text and background, and some additional features the theme provides. The typography options are useful in that they can help you make the most important content stand out and be readily noticed by users (heading, texts and links can have the colors you give them, from the Customizer). 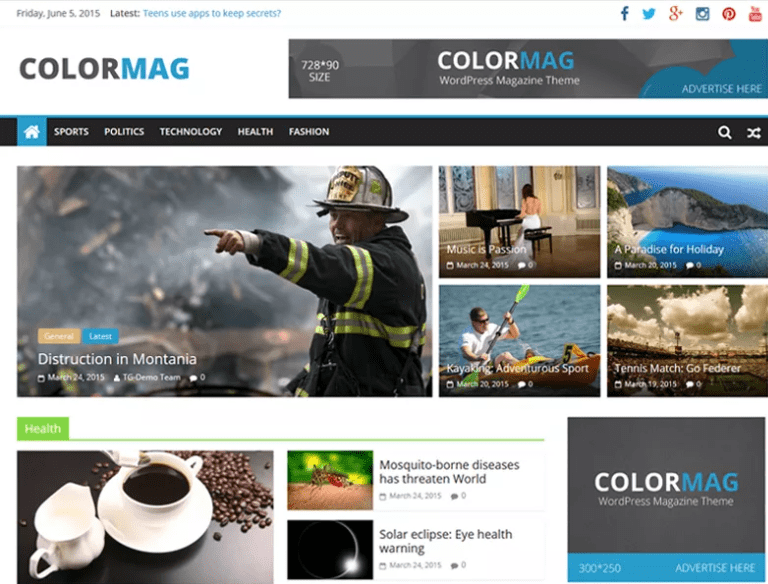 Colormag is a free theme perfectly designed for magazine-style websites. However, it can be customized to adapt to any type of niche. It comes with a wide range of features, making it ideal to customize a website into every detail. Besides the classical site identity options, colors and background image customizations, you also have the option to add a video or image file to the Header of your website. Thus, you’ll attract a greater number of visitors and focus their attention on important content in your website. More than uploading media for the Header, you have further customization options for the website Header: add breaking news, include a search icon, create a sticky menu, etc. The design options refer to selecting the most appropriate layout for posts, pages, overall site layout, etc. Social options refer to inclusion of links taking users to the company social media profiles (Instagram, Pinterest, Facebook, Twitter, etc.). 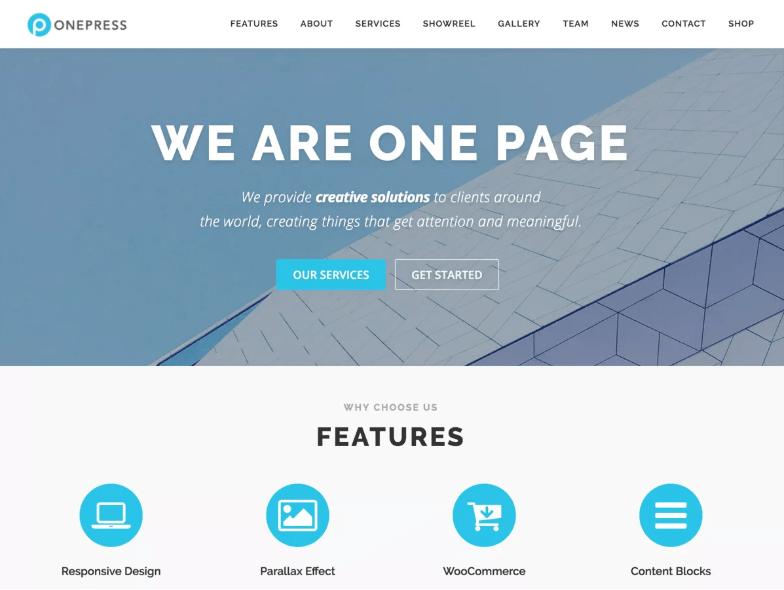 OnePress is an elegant theme that will help building elegant websites. It is useful both for business websites and freelance portfolios, and it will give a fine look to a website following classic design principles. It helps building not only presentation websites, but also e-commerce websites, due to its compatibility with the WooCommerce plugin. The specific theme options take you through all the elements in a website, and help you customize the entire website, as you want (from global settings, to header, navigation, blog posts and footer appearance, everything can receive customizations and have the look that you want). You can give a special look to titles of pages, by adjusting padding, color, background overlay and title alignment. The sections navigation includes extended options for each section of the pages you are customizing. Hueman is one of the best free WordPress themes. It loads fast and is mobile-responsive, so it’s a good choice for effective magazine-style websites. It offers the possibility to add an advertisement widget in Header, for website owners that plan to include ads in their pages. The Header menus can be adjusted for proper display on mobile devices, a search button can be added to these menus, and you can change their display based on scroll behavior. You can add links to social media accounts for the company, so you have the possibility to extend the community around the business. 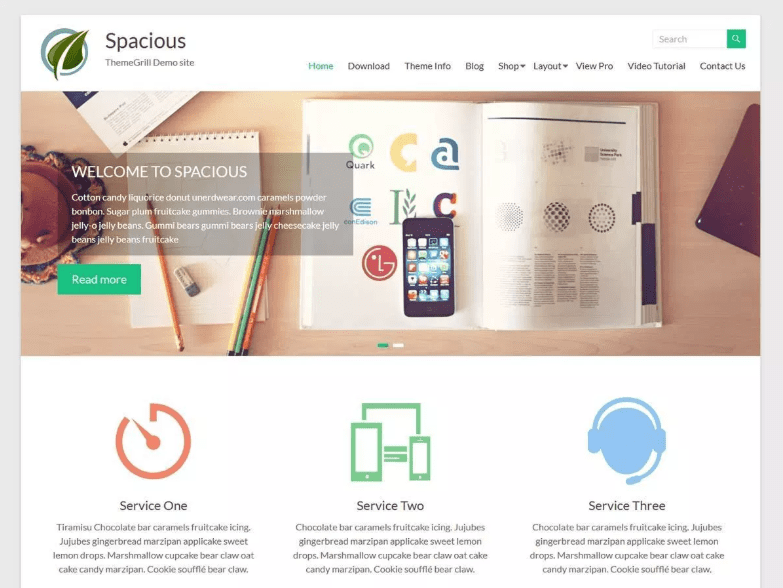 Spacious is a multipurpose theme you can easily adapt to the niche of your business. It has a clean, minimalist design that works well for presentation sites. The free version gives you the possibility to include a slider with up to 5 images. Upon activation, you can start customizing the slider, and attach a title/description to the element. Some additional features include: the option to set up featured images for posts and pages, an author bio section below the posts (if you plan to attach a blog to the website) and activate display of related posts (selected on the basis of categories or tags). 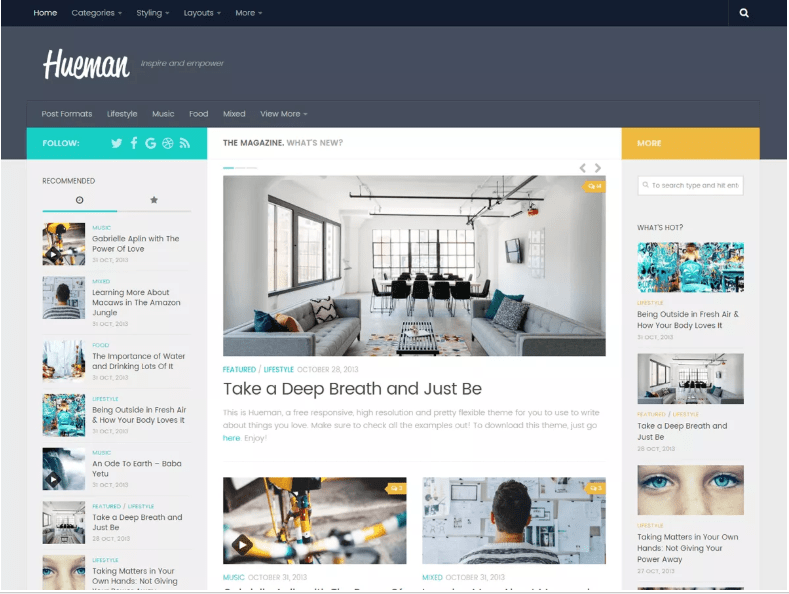 You can customize the layout, independently for posts, pages, and site-wide. In the Header, you can upload an image or a video file, to effectively capture readers’ attention and focus it on important content in your website. Responsive, as the name says it, outshines many others by its mobile-responsiveness. It has a grid system that helps it better perform at this point. You can enable the option for the menu to stick to the top, when users scroll down the page; you can also enable to show featured images for posts in the website; if you enable the option regarding minified css, you’ll benefit from faster loading times of the website built with Responsive. You have a wide range of options for the homepage (include a slider, define the headline and sub-headline, manage content and place a Call-to-Action in a strategic section of the front-page, set some content as featured content). You can enable sections such as an About section, a Testimonials section, a Team section, a Contact section. Responsive gives you the possibility to include links to the company’s social media profiles, and thus increase word-of-mouth and the message reach to a wide community built around your business. 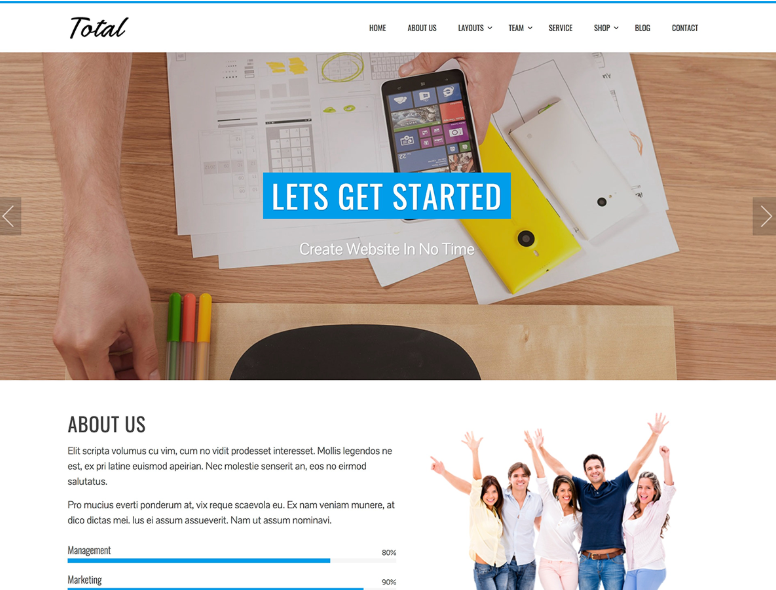 Total is a good choice for presentation websites. It is modern and has lots of features that make up a clean and elegant design. It has 10 sections for the homepage, you can choose to display/disable according to your wishes. You can choose to show a slider on the homepage, which gives a better look to the website and capture users’ attention. The sections you can use for the homepage: About us section with progress bar, clients’ logo gallery, featured section and services section with icons, portfolio section, team section with links to social media profiles, counter section, testimonial section, blog section that displays 3, 6 or 9 posts, a CTA section. 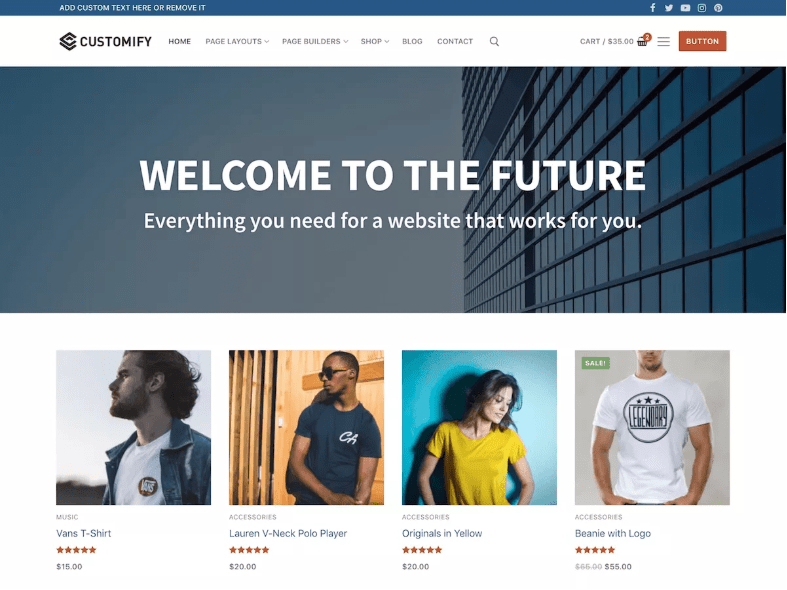 Customify is a very flexible multi-purpose theme, that can be used for building almost any kind of website. Its SEO-friendliness and speed make it an excellent choice. This is a real Theme Customizer Booster, with plenty of customization options that take your website to the next level. It perfectly integrates with website builders, such as Elementor, Beaver Builder, Visual Composer, Divi, etc. Its uniqueness resides in the Customify Header and Footer builders, that smooth the process of customizing headers and footers to the minutest detail. It is adaptable to any niche, so you can choose Customify to create a business website, a portfolio website, an online store, education websites, agencies, consulting websites, etc. Moreover, Customify is compatible with popular plugins, such as WooCommerce, Yoast SEO, etc. 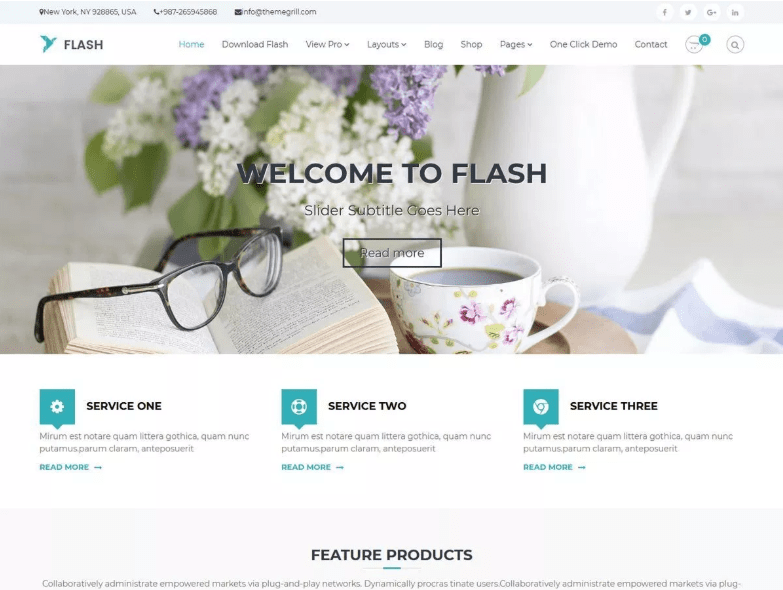 Flash is one of the best free WordPress themes. It is multi-purpose, so you can use it for any type of website that you want to create. The Flash theme options include distinct customizations for the Top Header and Header, and you can also adjust page Header separately. For the website pages and posts, you have further customization options regarding the page/post layout (there are 4 options for page/post layout). If you attach a blog to the website, you have the possibility to adjust the blog style according to 3 different options. 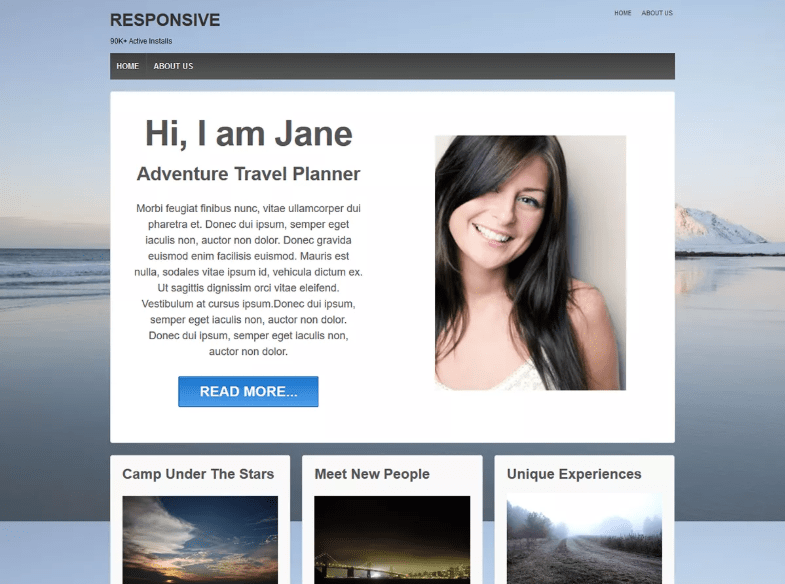 Onetone is a free theme designed for building professional websites in not time, and without touching any line of code. It’s useful for creating modern websites and giving online identity to creative businesses. From the general options, you can customize the error page (404), to keep users on site as long as possible. Also, you have several options for customizing page content top/bottom padding, column margins and define the layout the way you want. With Onetone, you have a whole set of options for defining the style of your website design: you can set a primary color in site, colors for different elements in the website (e.g. form background, form text, etc. ), select certain colors for the font (header text, page title, H1…H6, breadcrumbs text, links). For typography, you have a dedicated section where you can select font-family and variants for different texts in the website. 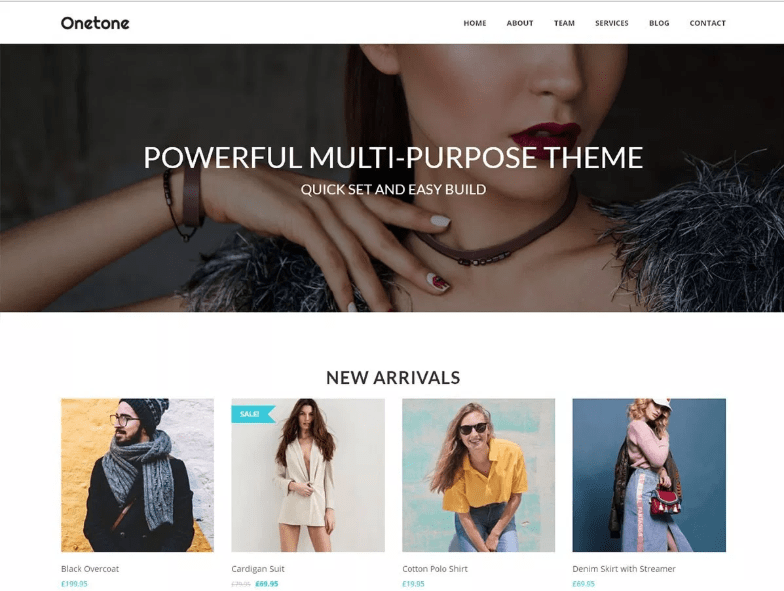 The theme is fully compatible with Woocommerce, and you have specific customization options for WooCommerce Products and Archive, in the Customizer. 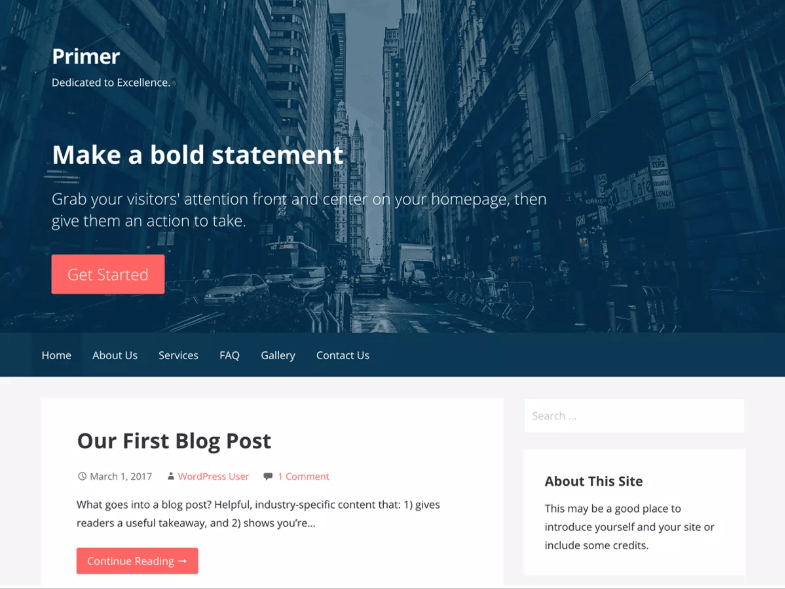 Primer is a free theme you can choose for building a new website and giving it a professional look. It has the necessary options for turning a draft into a complete business website. For the Header to get an impressive look, you can upload a video or an image of your choice (the video file can be uploaded from your device or you can provide the link to an external video file). You can add widgets to 6 different widget areas. 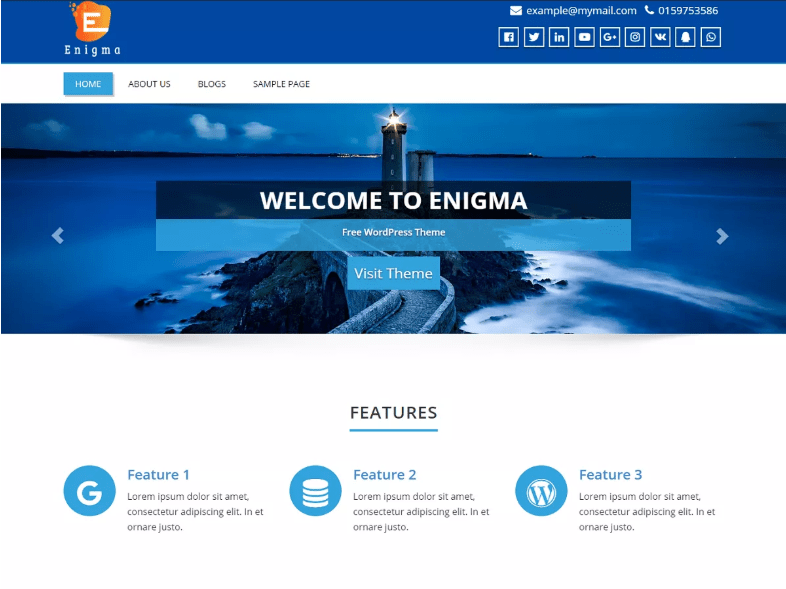 Enigma is an excellent free theme for building a website, in any niche. It is suitable for business websites, portfolios, landing pages, agencies, etc. To impress users, you can integrate a slider in the upper part of the front-page. There are several animation effects that you can use for making the slider look exactly the way you want. You can add slider descriptions, as well. You can add sections such as: a Services section, a Portfolio section with proof of successful projects, etc. You can choose to display posts excerpts on the blog homepage, if you want to attach a blog to your website. The theme is focused on visual elements, that can draw traffic to the website and keep a high engagement rate. 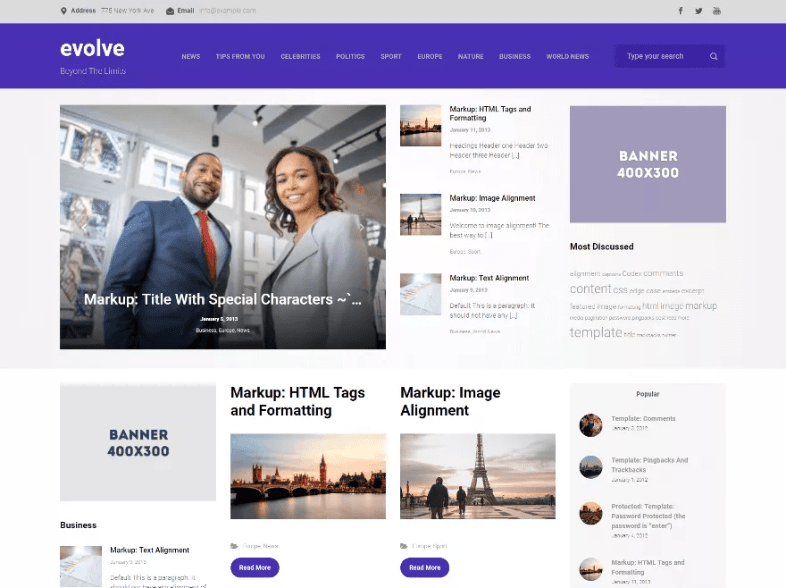 Evolve is the perfect free theme for building a fully customized website. You have a whole lot of customization options you can use, besides the classic ones, to create a website as you like. You have a custom front-page builder: you can choose what elements to display, and their order; you can add custom content to the homepage; for building trust, you can insert counters on front-page and prove the services quality by the numbers; in addition to counters, you can include a testimonials section, with proof from clients that you provide high-quality services. You can enable the option to have a sticky header (when users scroll down the page, the Header sticks to the top). For more complex websites, you can include breadcrumbs and facilitate navigation within the site pages. You also have a bootstrap slider and a parallax slider you can use for enhanced design of your website pages. 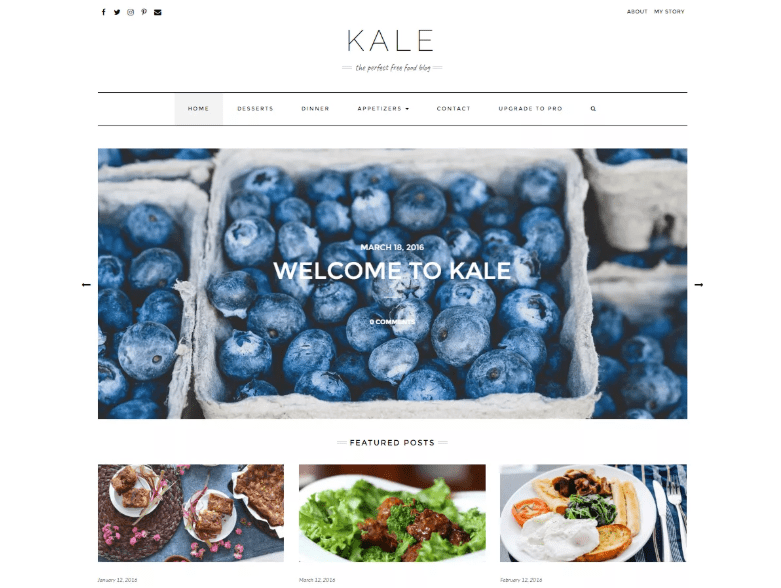 The theme is integrated with WooCommerce, so you can use Evolve to build an online store and start selling online. 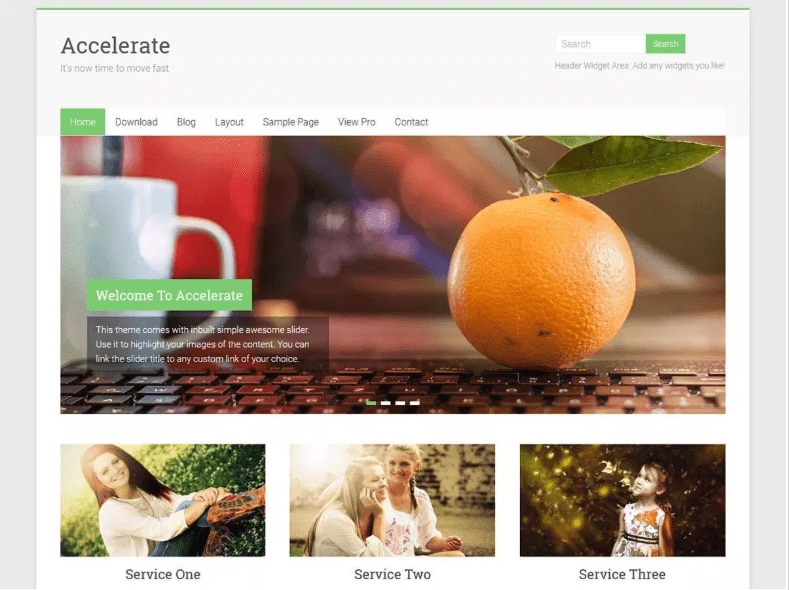 Accelerate is a simple-to-use free theme you can use to build any kind of website: business, portfolio, agency, landing page, education, blog, personal, travel, etc. You can create a slider, with up to 4 slides included. 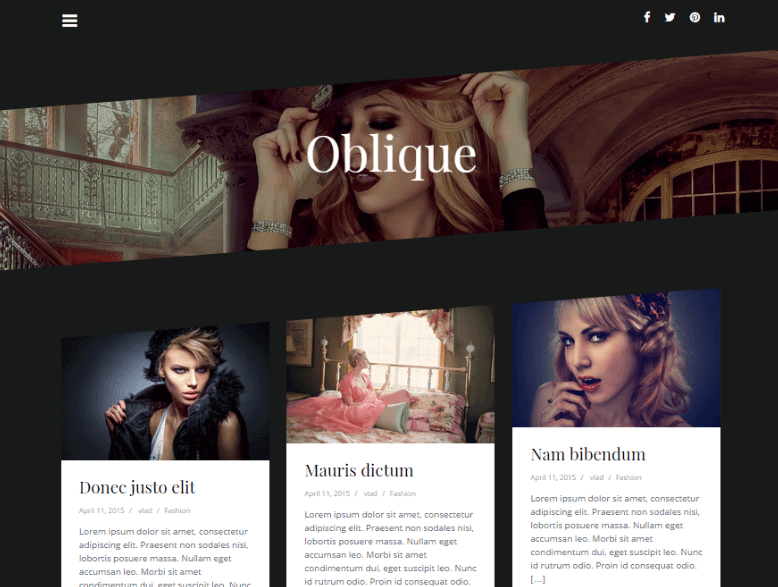 Oblique is a creative masonry free theme that works well for blogs and fashion websites. You can customize the website to your wishes, with the Oblique customization options. The menu items are visible from a hamburger menu you’ll find in the upper left part of the website pages. The minimalist design helps you build your website in no time and give it a clean appearance. Therefore, you can bring your content to front, and put a focus on the articles you’ll constantly add to the blog. The theme is SEO-friendly, and compatible with the most popular SEO plugins that’ll help your website/blog rank well in search engines. 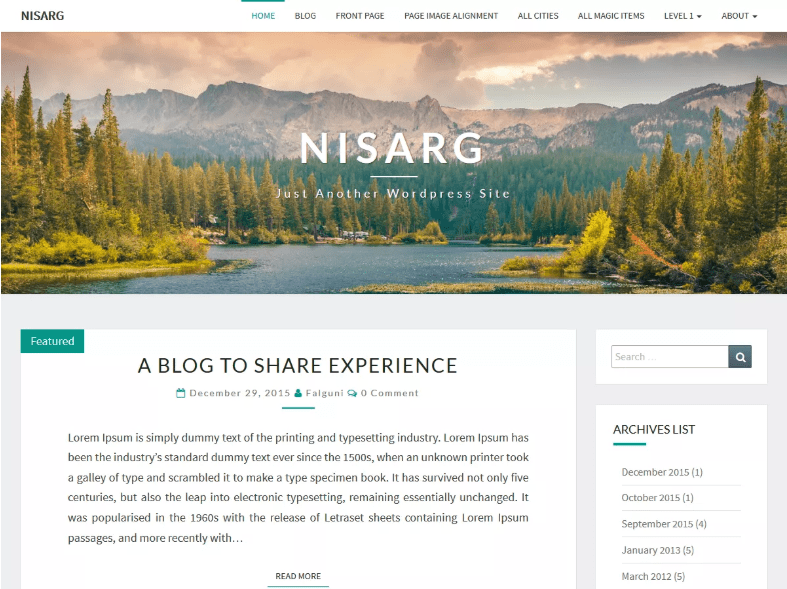 Nisarg is a free theme you can choose for mobile-friendliness and adaptability to any kind of niche: art, design, blogs, travel, photography, etc. You have control over the colors of the website (Header text, Header background, website background). Also, you can set an accent color for the website, and improve the design of your pages. For a blog, you can choose to show full blog posts or posts excerpts, on the post listing page.